The university’s annual awards for learning and teaching were announced at this year’s Learning and Teaching conference. Organised by the university’s Centre for Learning and Teaching, the conference featured a packed programme with nearly 40 presentations and keynote speeches by Professor Debra Humphries (Vice Chancellor), Professor Stephen Denyer (Pro-Vice-Chancellor Education and the Student Experience) and Professor Mick Healey (Higher Education Consultant and Researcher). The awards celebrate how committed our staff are to building on the quality and creativity of learning in the university. Award winners from left to right: Bhavik Patel, Julie Fowlie, Charlie Lea, Rachael Carden, Helen Stanley, Paul Jobling, Julie Scholes, Jessica Mills, Richard Jacobs, Nadia Terrazini, Caroline Hodges. 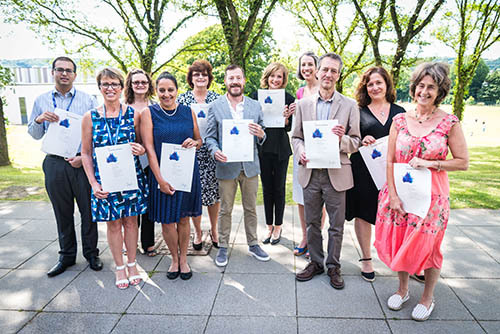 Congratulations to Jessica Mills, Senior Lecturer, Professor Julie Scholes and Helen Stanley, Principal Lecturer, each received an award for their Excellence in Facilitating and Empowering Learning. Tagged CLT Learning and Teaching conference, Excellence in learning and teaching. Bookmark the permalink.